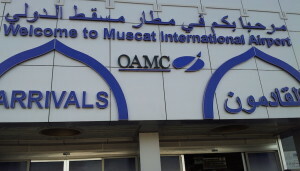 I had never been to Muscat, Oman (MCT), so I jumped at the opportunity to make the visit. I checked and realized that flydubai (FZ) flies there using Boeing 737-800s from its base in Dubai, UAE (DXB). So I partnered with them to make this trip happen. For my 7:00a flight this morning, I journeyed over to their Terminal 2 operations via my hotel shuttle which had made a stop at Terminal 3 first. The journey between terminals seems like it lasted forever, but at that hour it was only about six minutes. 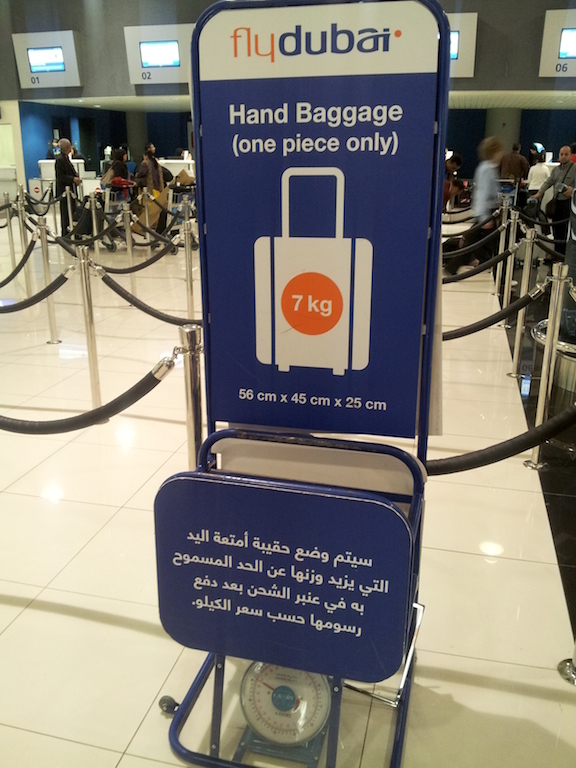 From the Dubai International Airport Terminal 2, flydubai currently serves more than sixty destinations. This include countries such as Afghanistan, Armenia, Iraq, Russia, The Maldives, Pakistan and Tajikistan to name a few. In my quest to visit every country in the world, Dubai maybe an excellent gateway in which to do so. You can find a full list here. The day before, I had received an email advising that I was eligible for check-in; great. 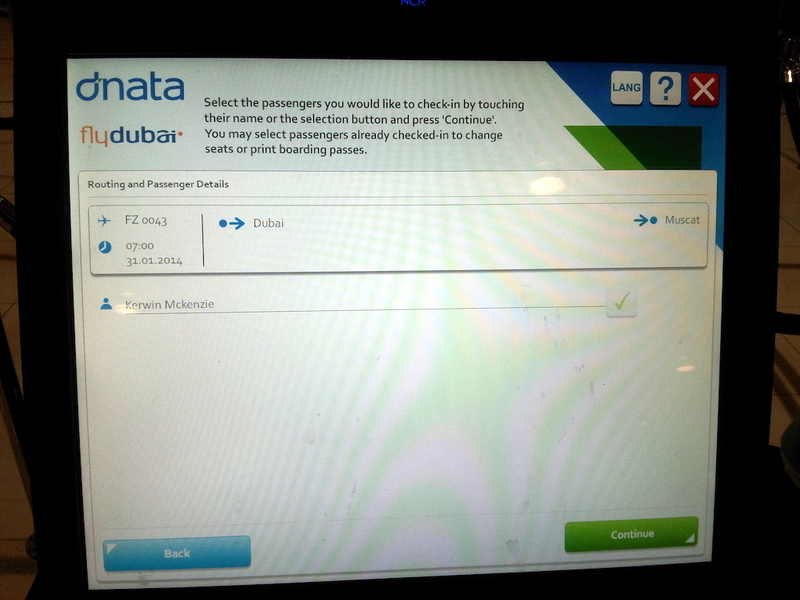 Online check-in is only open to select destinations at the moment. But when I clicked on the link and entered my confirmation number it told me I could not. At the airport it worked like a charm. It was a simple process; I was also able to change my seat as well. I had 2F, but wanted to sit in the back for this leg. I had only carry-on luggage so there was no need to stand on the check-in queues. 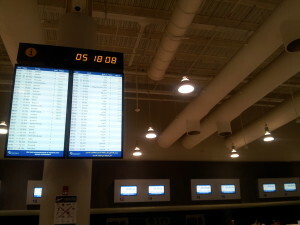 The airport was busier than I expected at that hour of the morning. One look at the departure board showed me why. 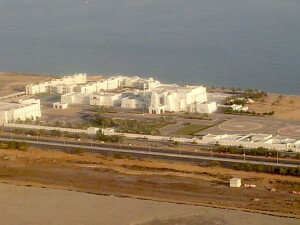 There were several flights to neighboring countries; most by flydubai. Smooth despite the line length. Immigration had a long line, but they quickly opened up two additional counters. Security was also long, but it went very smooth and I did not have to take off my shoes. I did have to take out the computer though, but no issues at all. I was a bit worried when I saw a slew of people arrive. I think they came from another Terminal. No worries as they went into a special line just for them, so we were O.K. 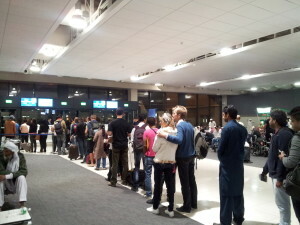 The boarding area was packed as there were about 8 or so flights leaving within minutes of each other. 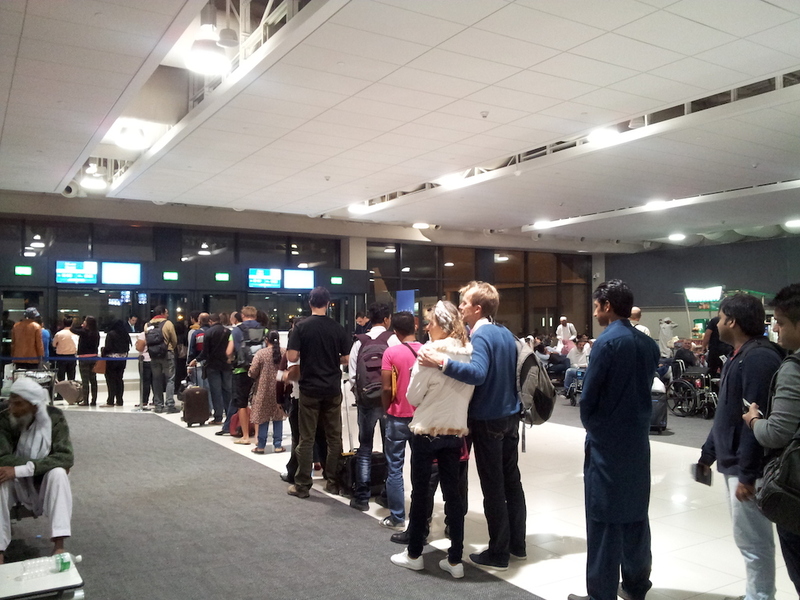 I did not hear a boarding announcement, but saw people moving on the queue and the “Boarding” light flashing. I got on the queue and was the third person to miss the current bus. No worries as I wanted to take a picture of the flight information board. I asked, the agent who said “No,” but I explained that I needed it for my blog post, so he agreed. We waited for a few minutes while I chatted with this lady who is American and working in Oman. It was great chatting with her while we waited. The bus then came and we went for a very long ride to the end of the airport. It had to be at least 15 minutes! considering the flight from pushback to touchdown lasts one hour, this was a long time. Finally, we got to our plane which was waiting with about five other airplanes next to it; I wondered where they were headed? We all got out of the bus and made our way up the stairs. I was hoping for rear stairs, but no go today. I made my way to 32F which I and changed at the kiosk from 2F. As it turns out 2F has extra legroom. We pushed back and then headed for the runway in the misty morning. You could not really see much at all. 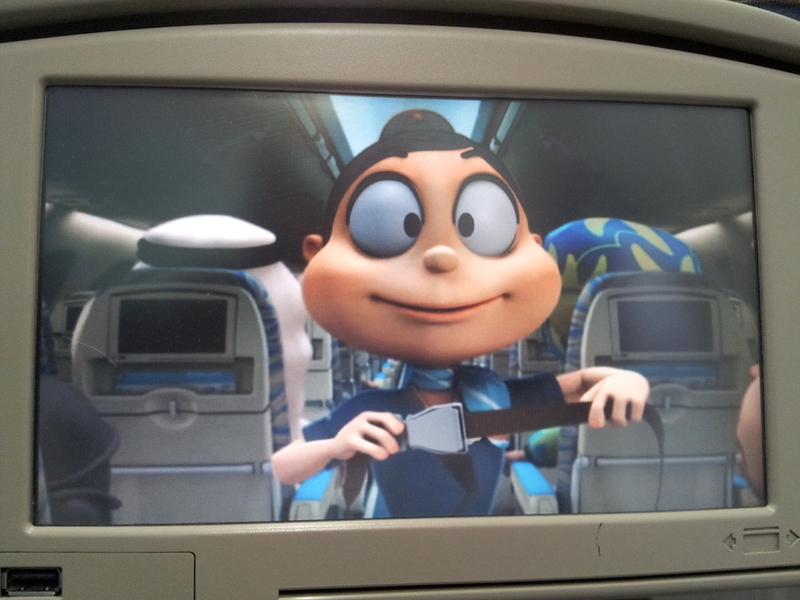 As we taxied out, the safety video ran us through its information. It’s actually an animated video. Soon, it was time to take to the skies which we did effortlessly. 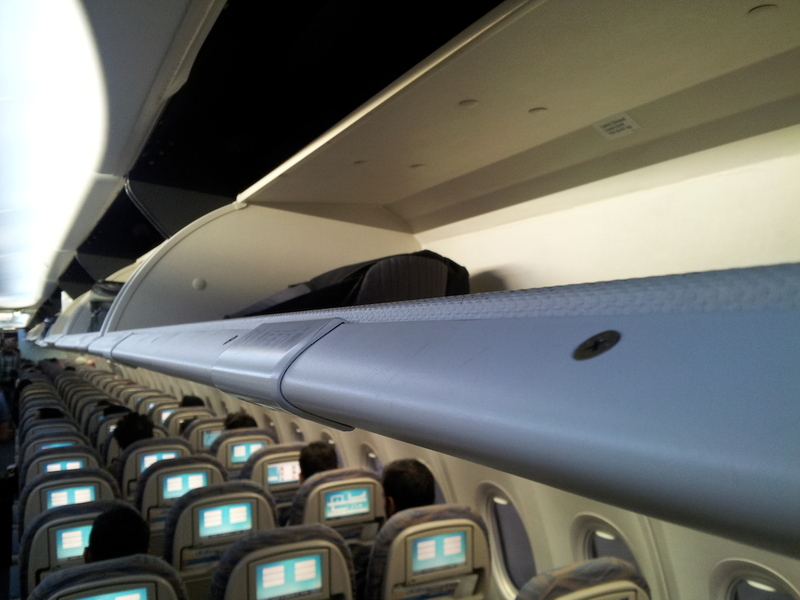 As the time was rather quick, the flight attendants started the service immediately. I had to try it all or as much as I could given the timeframe. I had a spicy chicken sandwich (15 AED) plus a bottle of water (5 AED) for a total of 20 AED, using a credit card to pay. There are in-seat screens which offer audio/video on demand. 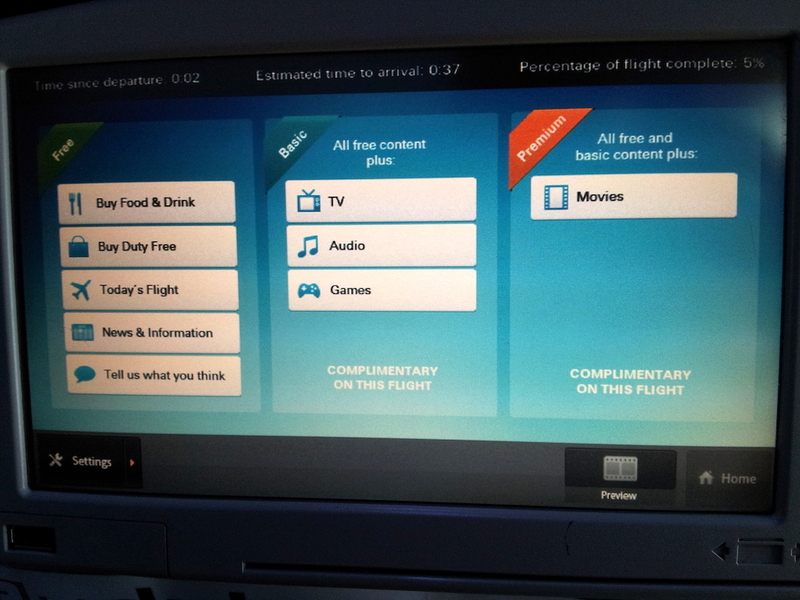 For this flight it was all free due to the short duration, but typically, there are three levels which gives you different amounts of entertainment. TV Shows, Movies, Games and Audio. It was soon time to land. 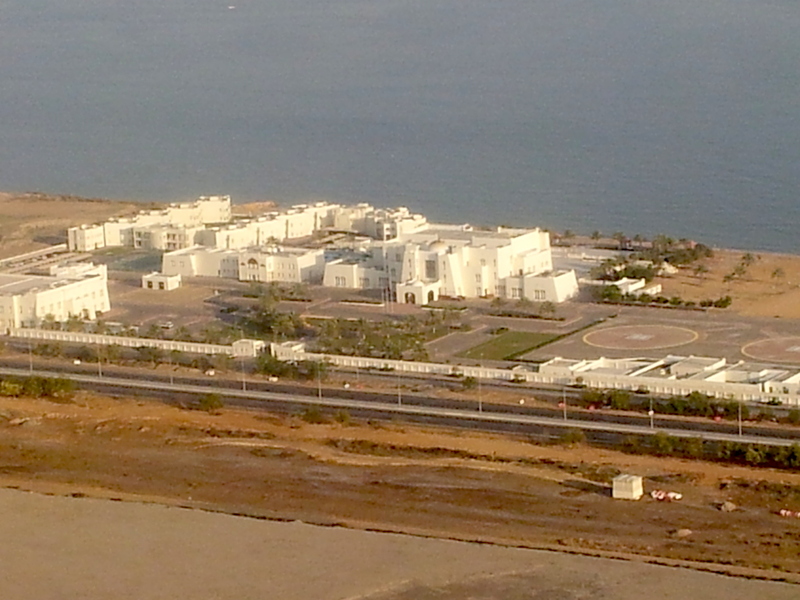 We passed the Muscat International Airport below, made it down to the town of Muscat itself, then made a two-minute right turn and headed back towards the airport. It was great to see the coastline as well as the city below. Almost every building was white and against the desert color it looked really beautiful despite the haze. 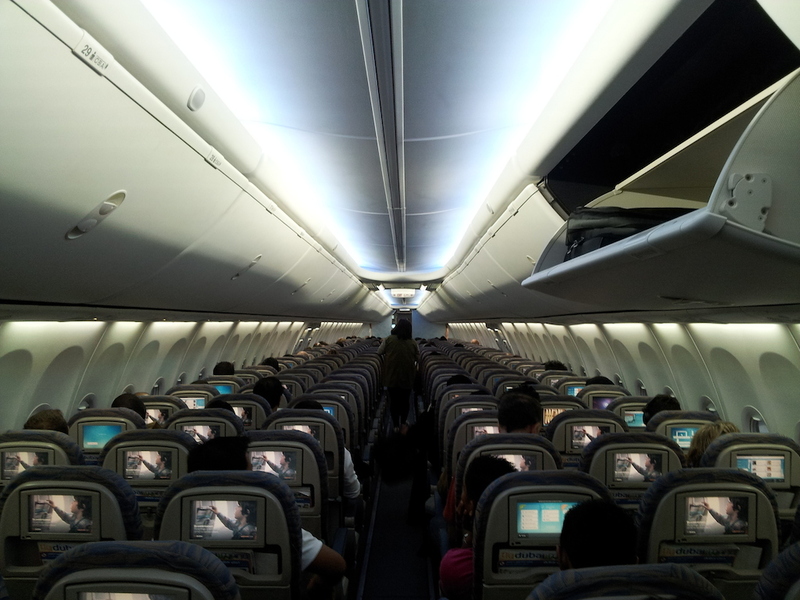 Once we landed, we taxied into the airport and deplaned at a hard stand. The airport is building a new terminal on the other side of the runway so I can’t wait to come back in a year or so to check it out. We then boarded a bus to take the short walk to the terminal. 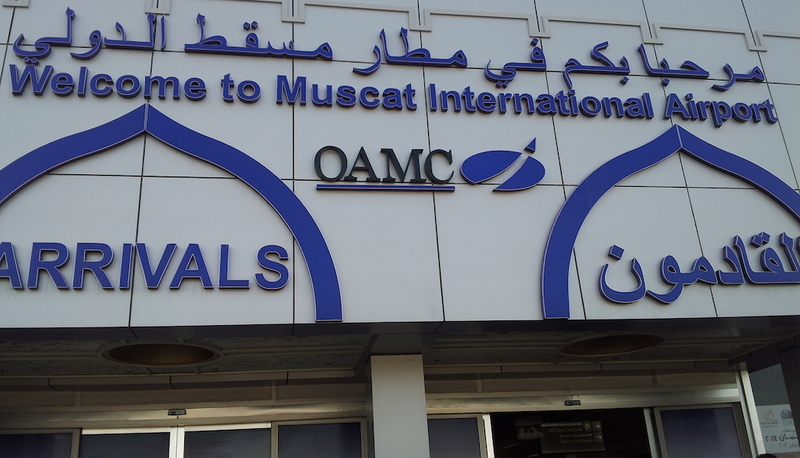 Once inside, I had to pay the 10-day visa fee of 5 Omani Rial, got cleared through Immigration, then Customs and voila, I am in Oman. 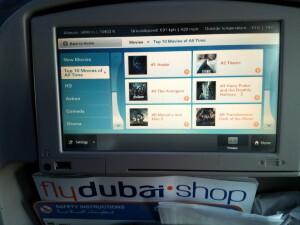 Summary I enjoyed flying flydubai. I left ontime and arrived ontime, the staff was courteous, airplane was clean, so no worries here at all. 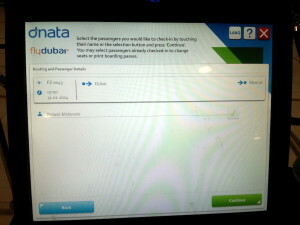 Have you ever flown flydubai? Please leave a comment below. Or maybe you want to fly to one of their many destinations such as Bangladesh, Moldova, Sudan or Ukraine. Let me know what are your thoughts below. Note: This trip was sponsored by flydubai, however, this did not influence my review. 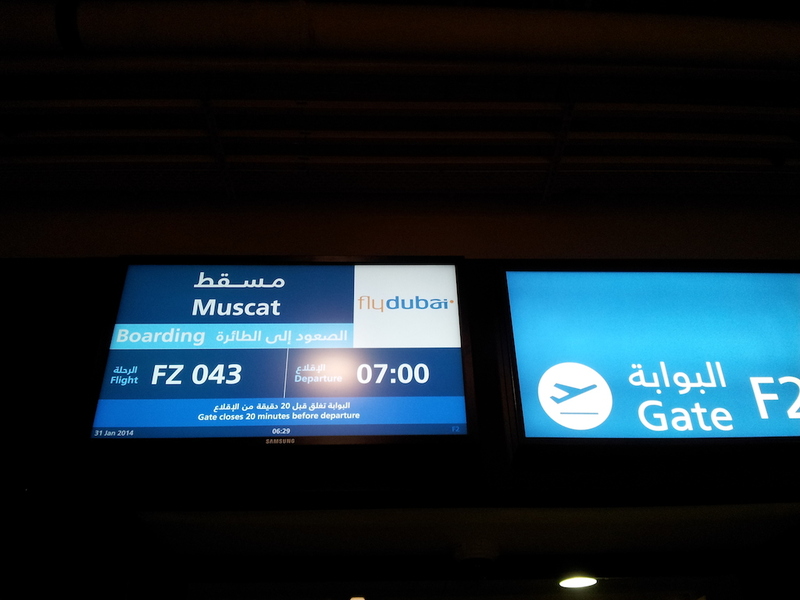 Great wrap up of the flydubai services. I haven’t flown them but they’re on my list of budget airlines that more people should know about simply due to the sheer number of interesting destinations they fly to. Dubai is such a great hub for travel. Thank you @Bethaney. They are really a class act. I’d highly recommend them. I’m also digging the destinations they serve. Not your “normal” ones at all.